Industrial used pallet racks are heavy duty racking systems used to support the largest containers and pieces of equipment. Unlike other types of racking systems, industrial used pallet racks normally do not have wire decks. Due to the heavy weight capacities they are expected to support, almost all decks in these systems are made from steel. This allows them to hold up to 48,000 pounds in weight safely. Industrial used pallet racks are a critical component to recession proofing a company that is an unstable economy that can still go either way. The most important benefit they create for any organization with limited warehouse space is the expansion of storage area within the four walls of the facility. We tell our clients daily how important this is when compared to the very costly alternative of either knocking down a wall to build on to the warehouse, or abandoning the facility altogether in pursuit of an expensive move. This is especially advantageous when it comes to heavy equipment storage. Many large items are so bulky or so heavy that warehouse management often feels the only safe place to store them is on the floor. Industrial pallet racks offer another option in this scenario. With heavy-duty steel decking, these racking systems can provide a sturdy, elevated platform that is readily accessible, secures and organizes materials stored, and is safe for workers in the general vicinity. This improves inventory control immensely, because it is much easier to keep track of stock coming in and out of the facility. Time management improves proportionally as well. With faster access to materials stored on industrial pallet racks, it is much easier to retrieve items that have to be loaded onto trucks and to store items that have come off trucks. If things get really busy and crews get in a bit of a hurry, industrial used pallet racks are built with structural steel components and can easily withstand an occasional bump from a forklift during a busy time. There are many designs of industrial used pallet racks that clients can choose from. The most popular design is the boltless design teardrop style. The boltless design offers several advantages over bolted equivalents, chief of which are ease of assembly and a more even distribution of weight. In spite of steel plating and structural steel supports, Easy Rack industrial warehouse racks can be assembled by hand without clips, bolts, or tools. The components literally snap together, making assembly quick and safe, and providing a unit that has less small components that can wear under the strain of heavy loads. In spite of the ease of assembly offered by industrial pallet racks, we recommend consulting extensively with a material handling specialist to determine the system’s exact specifications prior to order. Every new racking system (and most used pallet racks as well) are custom built storage systems made to the exact dimensions of a warehouse floor, vertical cube, industry type, and storage contents placed on the rack. These factors play a very critical role in determining the strength of the components used to design a particular industrial used pallet rack and should be either specified by an expert in racking or at the very least double check to make certain all calculations are correct and comply with safety and regulatory codes. 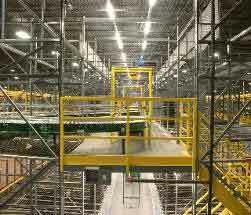 Industrial pallet racking systems can also be designed for outdoor use in inclement weather and cold climates. Again, talk to a material handling specialist at Easy Rack if a remote shipping yard or construction site is in need of outdoor heavy duty storage, and we will design a system specifically for that location.